Not just data management…data intelligence. FH Analytics opens up a whole new dimension of tools for intelligent decision making. Now fire departments can use this multi-directional data analysis tool to evaluate the data collected from all modules of FH Software, gleaning critical decision-making and planning intelligence faster and more readily than ever before. The easy to navigate dashboard interface provides real time information at a glance, giving immediate insight into staff training and equipment needs, turn out and reaction times, incident compliance rates, standards of coverage, and more. Contact your FH Sales representative for a demo and more information! Don’t miss the opportunity to add FH Analytics to your current FH software suite. Call us today! FH Analytics is an in-memory analysis technology; memory requirements are directly related to the quantity of data being analyzed. 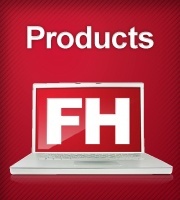 FH Analytics requires FIREHOUSE Software to be running version 7.9.14 or higher.